Spring means two things in my household: tax time and top-to-bottom spring cleaning. In my family I’m the “tax guy”; since I have the software and it does up to 20 returns, I end up doing everyone’s taxes. But this year it’s been a bit harder to meet the April 30 deadline; for over 3 weeks I’ve had a bad cold sapping my energy. Luckily, my friend Elizabeth May, Green Party MP and leader, has managed to get me a filing extension to May 5 – and the good news is, it applies to all Canadians! So if the looming tax deadline was stressing you, now you’ve got a bit more breathing space. More on how this happened in next week’s column. But despite 3 family members having versions of this cold, spring cleaning continues. This year, we’re tackling the dozens of old VHS tapes gathering dust on the bottom shelves. Years ago I had a VCR-DVD combo that could copy them over, but with everything else going on, never got around to doing it, and now that machine has gone the way of e-scrap. Yet there are still important memories to transfer: ultrasounds, family TV appearances, the full local broadcast of Live 8; things that need to be saved before the tapes are ditched forever. These are not actually my tapes. And that’s the tricky part: what to do with discarded VHS tapes? They can’t go in the blue box, yet we don’t want them clogging up landfill. And it’s not a trivial issue; more than 2 billion VHS tapes lurk in Ontario, a veritable mountain we can either bury or recycle. That’s where Project Get Reel comes in. A Toronto start-up, this social enterprise aims to solve several problems at once, by hiring people who face barriers to employment to disassemble and recycle VHS tapes. There are a variety of metals and plastics inside each tape, each of which goes to a different recycling stream, but first each tape must be opened by removing, by hand, 5 metal screws. This kind of simple, hands-on work is an ideal job gateway for people whose physical or mental issues are career stumbling blocks, or who have personal situations (like needing child care, or being a new immigrant) that get in the way of most entry-level jobs. There is still time, but just a few days, for you to personally help launch this project by visiting their crowdfunding site at indiegogo.com/project/project-get-reel, but only until Sunday May 3. With this funding they will get things ramped up by July. And to help, a supporter has just pledged to match all donations, so your money will count double! So hold onto your VHS tapes just a little longer – don’t throw them out, recycling is just around the corner. Visit ProjectGetReel.com and sign up to receive information on how you can drop off your tapes. In the meantime, start transferring any important memories over to digital media so you can park it in “the cloud” where it can never get lost, so they say. There are many tape transfer services in town, if you just have a few, or if you have a whole library to convert, you can get the right software and connectors to hook your VCR to your own computer and convert them yourself. Let’s clear out those tapes, and recycle them! Published as my Root Issues column in the Barrie Examiner as "Now's the time to clear out those VHS tapes"
Water is truly the stuff of life. Each living thing needs it; all life arose from oceans, which still provide a huge amount of our food. Fresh water is like gold, a resource we struggle to conserve and keep clean, even as corporations sell overpriced tap water with imagery of pure glacial springs. So how could water itself be pollution, if it’s something we all need? Is it possible to have too much of a good thing? To answer that, just ask my friends whose pipes burst, causing destruction and disruption. Ask someone who lost a loved one to a tsunami, or their farm to a flood. Ask a person being waterboarded (in between questions about if they are, or have ever been, an Al Qaida member) how they feel about the water of life which is threatening to choke the life out of them. Ask a citizen of a low-lying island whose very nation may soon pass below rising seas forever. So yes, you can have too much of a good thing, even water. And the same is true of carbon dioxide (CO2). As a Climate Reality presenter, I help people understand issues around global warming and climate change. But I repeatedly encounter an odd line of climate denial based around the assertion that CO2 is “plant food”, a healthy natural substance we all exhale, therefore can’t possibly be considered pollution, and would be ridiculous to tax with carbon pricing. Should we bill ourselves for breathing? Do we want to starve plants of their food? Of course, this is a facetious line of reasoning. Climate scientists, and Climate Reality presenters, know quite well the role of CO2 in natural cycles. In fact, the charts of atmospheric CO2 levels we display, like the one in Al Gore’s Oscar-winning “An Inconvenient Truth”, show CO2 fluctuating up and down yearly, due to higher uptake when the northern hemisphere (which has more land mass) has summer. We all learned about photosynthesis in grade school, after all. Yet climate deniers act like this is some revelation, some basic fact we totally overlooked. Nope, not the case! It is certainly true that CO2 is one of the ingredients plants use to grow. Farmers even pump extra CO2 into greenhouses, to grow flowers or vegetables faster. So pumping extra fossil CO2 into the atmosphere must help, too, right? Wrong. Plants need water, sun, soil and CO2 to grow. In a greenhouse, plants are given extra of all four, including CO2. But in nature, the amount of sun, soil, and water are constant, or even diminishing, so extra CO2 can’t help forests or crops grow better. In fact, open-air studies show higher atmospheric CO2 helps pests and weakens crops’ natural defenses. This means CO2 itself threatens our food supply, and that’s before we look at the higher temperatures, drought, fires and flooding caused by increasing greenhouse gases like CO2. There is no question: without atmospheric CO2, plants could not grow and our world would freeze. But that doesn’t mean more is better; having boosted the amount of atmospheric CO2 over the past 2 centuries from 280 to 400 parts per million, higher than ever before in human history, cannot fail to have significant effects. It’s a huge, uncontrolled, risky and irreversible experiment, one we must curtail as soon as possible. 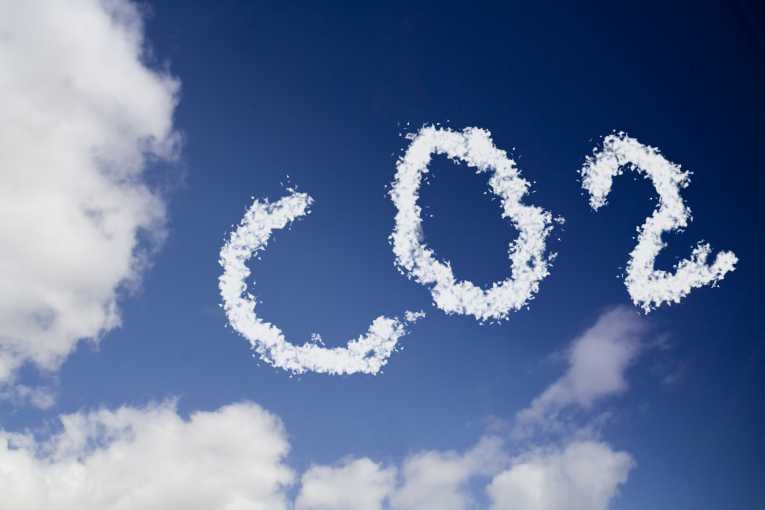 Published as my Root Issues column in the Barrie Examiner as "Extra CO2 isn't what our planet needs"
Sometimes, when a few citizens get together to try and improve the world, it creates something bigger, with more lasting value, than any of them imagined. That’s certainly been the case with Environmental Action Barrie (EAB), now known as Living Green. This home-grown charity started in 1990 is about to celebrate a full quarter-century of good work with a 25th anniversary gala on, appropriately, Earth Day (Wednesday, April 22, 7 pm). Thanks to our generous sponsors, especially Organics Live, tickets are only $25 each and will admit you to meet special guests including keynote speaker marine ecologist Peter Sale, author of “Our Dying Planet”. As he will relate, our planet does not have to die, but action is needed, and soon! 25 years has given us a lot to celebrate. EAB ran a volunteer recycling depot before household blue box collection, then took the plastics the blue box didn’t, until eventually blue box collection expanded to all plastics. EAB, partnered with the City as Be Green Barrie, also ran a retrofit program to install low-flow faucets and toilets across the city, giving Barrie one of the lowest per-capita water consumption rates in Canada. EAB helped connect the lead sponsors of the Spring Into Clean event, now a huge annual cleanup run by the City of Barrie. Alongside other initiatives too numerous to list here, we’ve helped educate on and reduce pesticide use, supported groups like Transition Barrie, founded FruitShare Barrie and run the Barrie Free Clothing Centre – Off the Rack. So help us celebrate 25 years of protecting our ecological health – tickets are available online at https://tr.im/organicslive. Another coming event is hosted by Simcoe County KAIROS, a group fairly new to our local community. At the national level, KAIROS has been uniting social justice work of 11 different churches and Christian organizations for 40 years. You may have first heard of KAIROS in 2009, when they lost their federal funding because Canada’s government decided to tie aid to poor nations to Canadian mining interests. Undeterred, KAIROS drew strength from its grassroots donations, and continues to work for good at the national and international level, but also right here in our community. Since forming in 2012, Simcoe County KAIROS has supported Aboriginal rights, protection of drinking water, social justice, peacemaking in Palestine, and related initiatives. In keeping with that theme, they will be hosting Gimme Shelter: The Right to Housing on Saturday, April 18th at Grace United Church. Access to housing is a major concern in our region; according to the Canadian Mortgage and Housing Corporation, Barrie is second only to Toronto for core housing need. That not only means some people are homeless, but that many more are precariously housed, unable to find suitable or affordable housing for their families. So join us for a morning of information and discussion with keynote speaker Michael Shapcott of the Canadian Alliance to End Homelessness and panelists Barrie Mayor Jeff Lehman, United Way’s Carla Dermott, and David Busby Street Centre executive director Sara Peddle. The event runs from 9 am until noon and will feature refreshments. Attendance is free, but pre-registration is appreciated by contacting emegareau@hotmail.com or calling 705-252-3459. Yeah, a storm is threatening my very life today; If I don’t get some shelter, LORD, I’m gonna fade away – Rolling Stones, Gimme Shelter. Published as my Root Issues column in the Barrie Examiner as "Home-grown charity celebrates 25 years"
Provincial and federal budgets loom: taxation is a hot topic. The price of living in a modern, civilized nation, it nevertheless rankles when part of our earnings are deducted leaving less to spend on our families, every purchase incurring sales tax making life more expensive and shrinking our purchasing power, every enterprise paying what feel like fines for success. Some pundits even perennially complain of being taxed into the poorhouse despite driving fancy convertibles or building their own hobby studios. Despite undeniable benefits of high-quality accessible education, health care, and transportation, it seems hard to find a direct connection between taxes paid and benefits received. I just read a book that turns this entire topic on its head, suggesting we could have our modern, progressive society without paying any taxes at all! In “Land,” Martin Adams demonstrates how the value we receive from owning land is created by the community rather than ourselves. He then makes the eminently fair proposition that we pay for the value the community creates and gives us, while keeping for ourselves the wealth we ourselves make or earn. In practise, this would mean paying about 80% of the annual rental value of our land in “community land contributions” that would fund all the public services we have come to expect, in exchange paying no tax for owning buildings, earning a wage, producing a good or service, or buying and selling. All taxes would go away, replaced by a single payment in direct proportion to the economic benefits we receive. But could such a system be fair and progressive? By George, yes! As Adams shows in his analysis of progress and poverty, taxation puts unhealthy burdens on the average income, while empowering those with large land or resource holdings to collect rent from the rest of us largely untaxed. Yet they didn’t create what our rent is buying: they didn’t make the land or the resources under it, they only claimed it as their own, while the surrounding community made that location desirable. Even though we were all born to this planet and, in all fairness, the Earth belongs to everyone, some people make us pay them merely to live on this planet, holding real estate for ransom. Our supposed capitalist free market is actually a predator culture of rent-seekers. Paying land rent to the community instead of to private landlords would not cost any more for anyone who rents land, it would just change who receives the payments. And it would end the inefficient misuse of land, including things like urban decay and sprawl, because it would penalize wasteful land use, rewarding efficient and productive enterprise. Each person or business would only want to own as much land as they actually needed; this would have the side benefit of reducing the stress our expanding cities put on the natural world. As shown in the book’s charts, appendices, and links, this measure would make housing more affordable, end the boom/bust cycle by designing a depression-free economy, and unleash innovation and ecological living. It would truly provide a better way of sharing the earth, perhaps even be the silver bullet for most of the woes of the modern world. If you find these goals worthy, then I highly recommend getting your own copy of “Land” to learn how it’s all possible. Published as my Root Issues column in the Barrie Examiner as "There is another way we can live off the land"
Holidays seem to be coming fast and furious in what is normally a season of “winter blahs”. The addition of Family Day to the February calendar helps a lot, and then when March Break feeds so quickly into Easter it feels like we are seeing family more often than perhaps we deserve. Unless, that is, you can’t spend time with family, for reasons of circumstance or geographical or emotional distance. Then holidays can be a bit depressing. Luckily, through the efforts of some local heroes, people in Barrie can enjoy a community Easter dinner on Monday March 6th downstairs at Central United Church on Ross St. Founded by Rose “Rosie” Romita and now run by Hope City Church, this evolving tradition depends on community to build community. People with time or money to give come together to help prepare and serve a meal, and people who need food or holiday companionship come together to eat. As Rosie becomes busier on Barrie’s city council, others are helping fill some key roles. Hope City Church is working on volunteer registration and training, so if you’d like to help with this event, particularly the preparation on Sunday, please email Jen@HopeBarrie.com. You can now also receive charitable receipts for much-needed financial contributions, which you can do in person or through the button at www.HopeBarrie.com. Or if your preference is to donate goods, there is a need for boneless hams, desserts of all kinds (pies, cakes, cookies, brownies, muffins, etc.) and canned or bottled beverages. All the food for this event is donated, will some of it come from you? 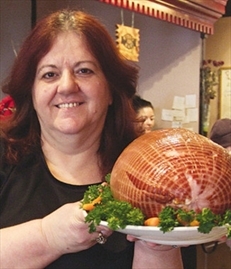 The traditional meal of ham, carrots, mashed potatoes and salads is being prepared this year under the direction of Joelle Golden of Auntie Jo’s Kitchen, located in Barrie-by-the-Bay. And as usual, there will be equipment set up by B101 for singing and karaoke to help bring the spirit of friendship. What was once a one-person affair is becoming a community partnership made up of many links. Inspired by Rosie (who still takes a leading role), hosted by Central United, organized by Hope, with cooking by Auntie Jo, and volunteers from the community preparing food donated by generous locals like you, this really does show how everyone can come together to build something special and lasting. So now there is no reason to be lonely at Easter, and every reason to come down and partake in one of the 600 free meals served at this event. Going beyond food, this is true relationship-building, part of how a city becomes a community. Even if you do get to spend some of Easter with your own family, you can still become part of this larger family, and be welcomed by one and all. We hope you will! Published as my Root Issues column in the Barrie Examiner as "Many heroes behind community Easter dinner"